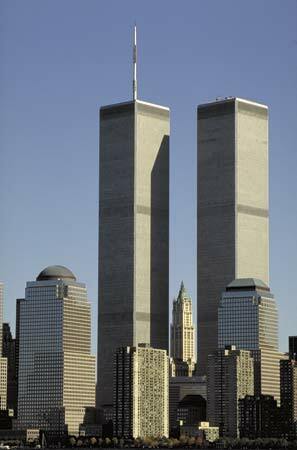 The World Trade Center complex and the Twin Towers were once such a big part of the New York City downtown skyline. I believe over 50,000 people were employees or visitors in those buildings every day. My husband worked in 7 World Trade Center -- the last building of the complex, which was also the last building to fall on 9/11 due to damage and fires started by the collapse of Twin Tower One. Luckily my husband was not in his office that day, as he was on an assignment, and no one from his office was hurt. He did personally know some of the people who were killed on that tragic day, however, and it took a long time of mourning for us to be able to bear with the grief of that and a world forever changed. Even now, seven years later, it is hard to look at the NY skyline and not see those buildings reaching up so proud and majestically. 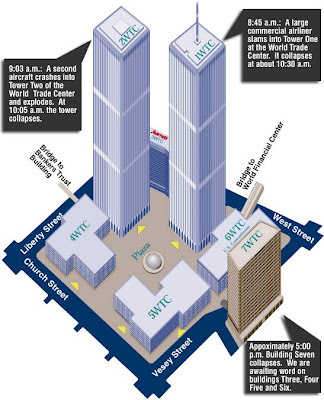 This diagram shows the layout of the World Trade Center buildings which were all destroyed by the collapse of the towers, and here is a timeline of the area from prior to the official dedication of the World Trade Center in April of 1973, to developments post 9/11. The 16 acres of land where the World Trade Center once stood has become known as "Ground Zero." 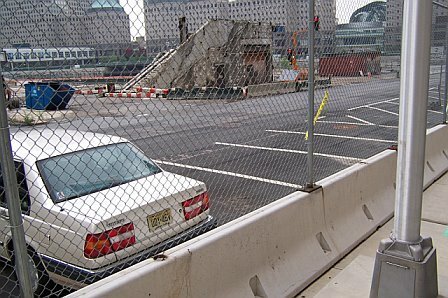 Much of lower Manhattan was barricaded after 9/11 for the rescue/recovery phase and then the demolition and removal of the debris. Many businesses in the area were interrupted or permanently closed because of this. Over time more and more of the surrounding blocks were reopened and the area began to recover as resilient New Yorkers were determined to bring commerce and business back to lower Manhattan. 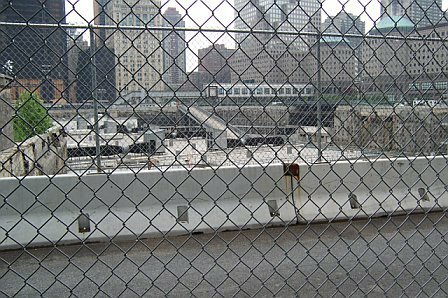 Presently, Ground Zero is almost completely concealed by construction fences as the rebuilding has begun. Below is a view of the outside staircase that survived Sept. 11, and remained the only above-ground remnant of the trade center complex. Its 37 stairs once connected the outdoor plaza outside the twin towers to the street below. It served as an escape route for countless survivors of the attack on the World Trade Center. After years of debate over whether and how to preserve the structure, it's moving about 200 feet west on the site, to be stored until it can be installed at the Sept. 11 memorial. Preservationists and survivors of the 2001 terrorist attack began campaigning years ago to leave the staircase where it was, but it sat in the middle of the footprint of one of five skyscrapers being built to replace the destroyed towers. This staircase is especially significant to me as I use to wait at the bottom for my husband when he left his building when I visited him at work. It was near a coffee shop with outdoor tables, and a subway entrance was nearby where we would catch the train back to Brooklyn. 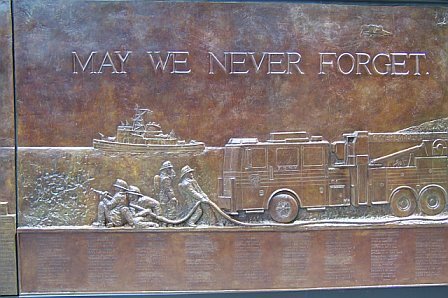 I am pleased that it will be preserved as part of the National 9/11 Memorial Museum. Here is an Earth Cam website of Ground Zero where you can follow the progress of the construction of the "Freedom Tower," the new 1,776-foot building that will be the centerpiece for the new World Trade Center. 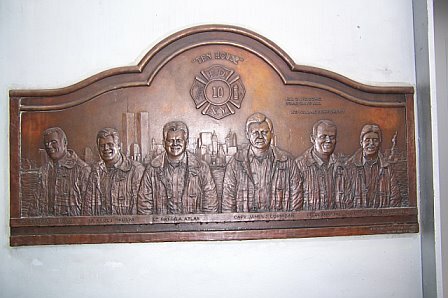 Below is "10 House " Ladder 10 Engine 10 of the FDNY. 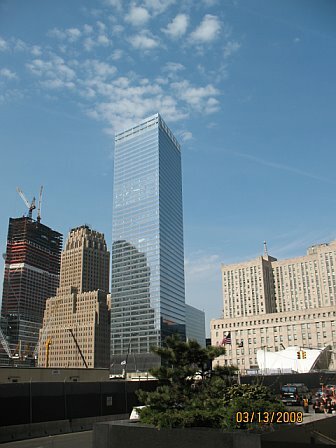 It is located at 124 Liberty Street which is right across the street from the World Trade Center site. 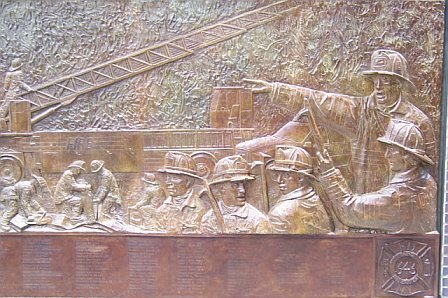 It lost 6 firemen on 9/11 and was severely damaged that day. It reopened November 5, 2003. 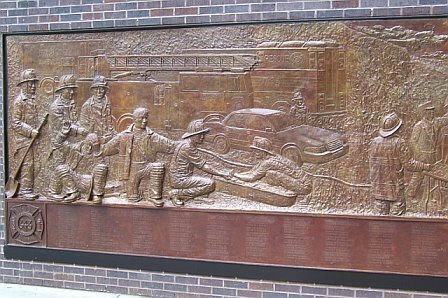 Below is a plaque on the firehouse front wall that memorializes the six fallen firemen from this firehouse. 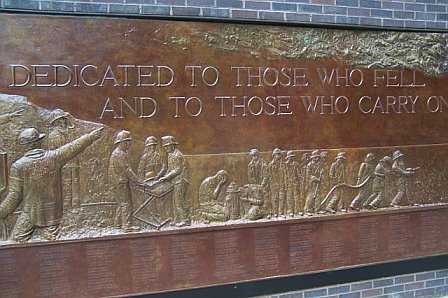 An impressive 56 foot long and 6 foot high Memorial Wall is located at the Ten House western side, and is "dedicated to those who fell and to those who carry on." 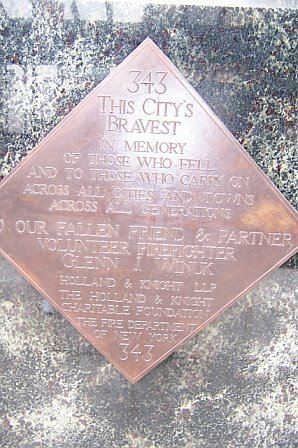 It was a gift from the law firm Holland & Knight to honor the 343 members of the New York City Fire Department and a Holland & Knight partner who perished on 9-11-2001. 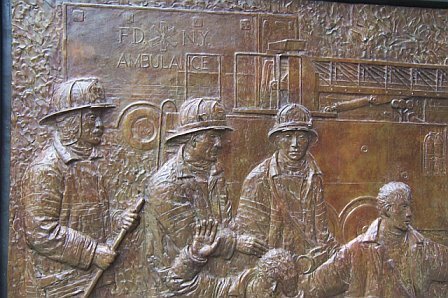 And the following are pictures of the large bronze bas-relief memorial bolted to the side of the firehouse. You can go here to see the plaque close up and in greater detail. 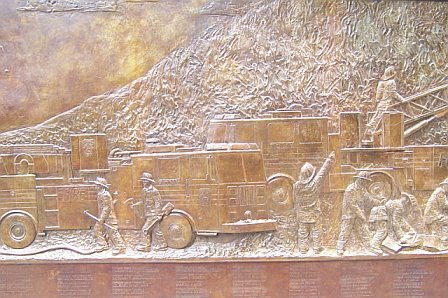 To read all the fallen firemen's names on the plaque go here and click on the bottom plaque for close-ups. It truly is a wonderful and inspiring memorial to these brave heroes. 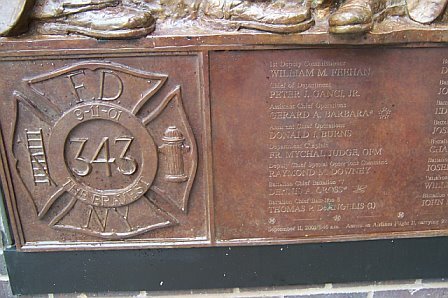 There is also a beautiful tribute on the FDNY website to the fallen firemen. May we never forget them, and may they rest in peace. My next blog I'll end my day in lower Manhattan with a few miscellaneous photos of other points of interest that are in the area. Thanks for all of your interest and kind comments. I hope all that have been reading will consider visiting New York City someday to see all of these sights yourself. Dear Pat, I can only imagine how hard it was to write this post for you. And I am so glad you did – history coming from people like you who witnessed such a tragic events and write down very personal experience for future generations to share. I remember this day too - so clear, like it was yesterday, with same emotions of pain, horror, anger.I am so happy, SO HAPPY you husband OK after all! The gift from Holland and Knight that reads "Dedicated to those who fell and to those who carry on" is so moving. I so admire the spirit of New Yorkers. Are you, overall, happy with the plans for the Memorial Museum, etc.? I'm happy with the Memorial Museum's plans so far. It is hard to please everyone. As time goes by and our nation heals I feel the horror of 9/11 will fade from most of the non New Yorker's minds. I guess that is a good thing, but I am hoping the Memorial Museum will be a testament to the bravery and service of many that died that day, and also to the innocent lives lost. Last year we were in NYC during the Spring. It was our first trip there since 9/11. I felt an overwhelming spirit that was somehow different than during our trips in the past. It was a good, warm spirit...surreal maybe but sweet. Like the city had softened a little. I may not be making sense here.. I have so enjoyed your photos and writing. NYC is one of my favorite laces on Earth. It will always be so. Trying to explain 9/11 to Grace was difficult but I do think she understood. Being at ground zero was chilling. On our last visit to the city, we had been there...been in the towers. So many of our pictures have them in the background. My father was a fire fighter here in Ohio for 25 years. He had just passed away when 9/11 happened. I know he would have been so proud of his fire brothers. Thank you for sharing these pictures, it is amazing how that city has recovered. Those resilient New Yorkers! I'm so happy your husband was saved from the tragedy of bldg 7. What a blessing from God! The son of a friend of ours lives in Manhattan and performs off-Broadway. He should have been on the train that ran under the towers but was delayed because of a long rehearsal. Thank you for going through the pain of your personal account of 911. It can NEVER be forgotten! We must all remember! Well, this time I brought my tissues with me to visit your blog. Good thing I did. Thank God your husband was not there that day! This must have been a very emotional visit for you. But thank you so much for telling us the story and sharing your wonderful photos. Someday I do hope to go to NY and this will definately be on my list of things to see. Although it can be hard to visit and remember things like this, I do think it's so important for people to do if they can. Wow Pat! Thanks so much. I'm so sorry for all the grief caused by that day. I can only imagine. I hope there is some peace for you in telling the story. I remember I was driving home from working the night shift that morning, when I heard on the radio. All I could think of was the old "war of the worlds" radio broadcast (I know that probably sounds weird)...I couldn't believe it was real. I remember I was sitting in rush hour traffic looking into the cars sitting around me...looking for some sort of reaction on their faces that this had really happen. That what I was hearing was real. Thanks. That day and the days following were so awful. I can't imagine actually being there. I sat in front of the tv and cried for what seemed like forever. Even now looking at the pictures all the memories come flooding back. I still stop and listen to the few country songs that were written about it. I'm so thankful for you that your husband wasn't there. I'm so sorry that you and your fellow New Yorkers had to actually live through the tragedy that so many of us watched on tv. I know I will never forget. Your tribute to that awful day is respectable and beautiful. That day changed our lives in unfathomable ways. That day gave me the courage to leave a 17 year marriage that was dead for over 10 of those years. Its amazing what tragedy will do. It remains raw. 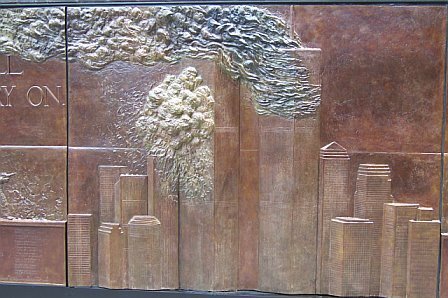 After reading your post today I remembered you telling me you wrote about Ground Zero and I went searching for this post and found it. I had to stop reading it 1/2 through because I was crying to much to read more. After a break I came back and finished it. Everyone in my family was born in New York but me. I'm born and raised in CA. The funny thing is no one in my family wanted to ever move back there. I went to visit and as soon as I got off the plane I felt like I was home finally. I fell in love with New York and the love affair has never ended. I still long to live there. There is something so special about New York and the people that live there. It's different then anywhere else. New York people are proud of their State. The city is so full of life. I have not been back to New York since 9-11. I just can't even picture how it will feel to see the sky line being so different and to visit Ground Zero. I do know it's a place I want to go to alone. To spend time there and mourn the loss of everyone there. I know it's strange but I feel like I am part of New York. I can't really explain it. So to me, 9-11 was very personal. Like the attack was on MY CITY. I can't even fathom the fear and pain you went through living there. To see it happen before your eyes. To know the place so well you knew just where they were talking about. Thank you so much for posting this. You are wonderful and strong. My husband and I just returned from a visit to NYC and wanted you to know that the memorial wall was the most emotional and heart breaking exhibit that we saw at ground zero. 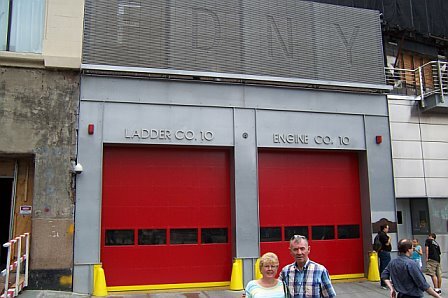 My husband is a retired firefigher and neither he nor I could actually speak while we were looking at that wall, because we were in tears. 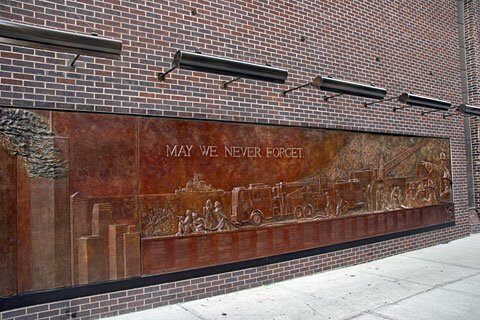 Is there any where we can order a picture of the memorial wall? My camera battery gave out and I wasn't able to get any photos. Thanks so much. 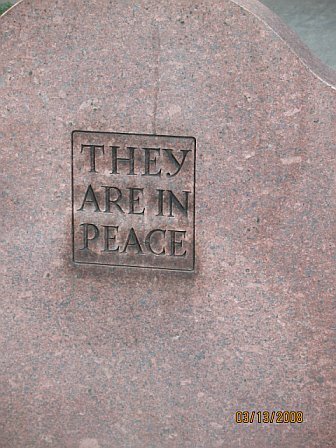 Perhaps they would be able to give you information on how to go about purchasing a professional photgraph of the memorial? I hope that will be of help to you! Irish Soda Bread ... or not? Goodbye Emerald Isle... until next time! St Patrick's Day Link Fun!